Where would we be without the benefits of convenience and storage bought by frozen food – be it in your home kitchen or a commercial kitchen? The method of freezing food preserves it for longer periods and helps to maintain its flavour, quality and nutrients. No preservatives are added because the act of freezing itself is a natural form of preservation. Captain Birdseye himself, a.k.a. Clarence Birdseye, patented flash freezing (or quick freezing) foodstuffs back in the 1920s although the process had been implemented long before its commercialisation. The convenience food market has come a long way since the 1950s when frozen dinners or TV dinners soured in popularity and the development of technology with the microwave further added to this convenience with almost instant access to a hot meal. Hot yes, although many would argue the nutritional value and quality of a freezer to microwave to plate meal … much improvement has been made during recent years. Today, many restaurants and commercial food retailers take pride serving locally sourced food, fair-trade ingredients and “freshly prepared” meals. That said, frozen food is just as tasty and nutritious as its same-day picked counterparts. As long as it’s transported and stored appropriately in suitable freezer and refrigerated equipment, for an apt period of time, and then properly thawed before preparing, the flavour and wholesomeness remains. In fact, the process of freezing fruit and vegetables can actually prevent the loss of delicate vitamins and nutrients. Locking in that bursting savour to reveal the ‘just picked’ taste is hugely beneficial and we all know how important the taste of food is when it comes to guest experience. One significant benefit of frozen food for a commercial kitchen is the ability to serve seasonal cuisine all year round. Importing food from temperate climates or purchasing it local-grown during spring and summer months can extend the lifecycle of a food menu. Fresh fish is often frozen on the morning of the catch and frozen packers deliver promptly to restaurants, hotels and supermarkets with 24 hours for freshness and enjoyment. 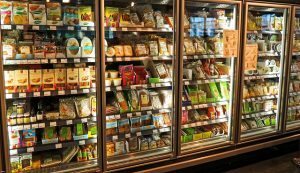 Frozen food can also help to reduce commercial kitchen waste because you only use what is needed. 6 March celebrated National Frozen Food Day. The day has been observed since 1984, mainly in the US, and even has a mention from ex-president Ronald Reagan. Fresh food, cupboard food and frozen food combined form the staple essentials of a catering kitchen. To learn more about brand new or refurbished catering equipment for your commercial kitchen call the team on 01384 459111.